My Dad's Model Steam Engine Boiler Page. 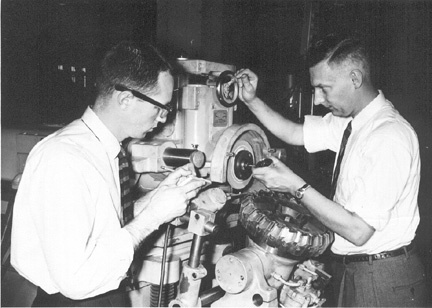 My father, Jan van Roojen (guy on right in photo above), was a mechanical engineer who immigrated from Holland to Canada and then the United States in the early 1950s. He spent most of his career at Ingersoll Milling Machine Company in Rockford Illinois, but also worked for a time in Mattawan, New Jersey. He worked up until his retirement at age 70, and then went back to work for Ingersoll for several years as contract help. He had hoped to build models in his retirement and in fact did complete one nice steam boiler for a steam engine. 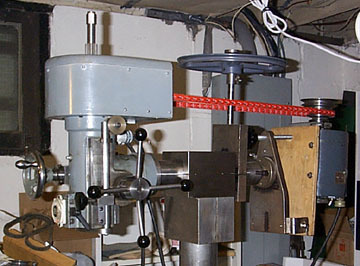 In pursuit of the model building goal goal he built a small machine shop in his basement in the thirtyfive or so years leading up to his retirement. It was during his time in New Jersey that he built the milling machine displayed here, but he continued outfitting his shop until the final years of his life, often with tools he made. And he kept making at least small modifications to this machine throughout his life. 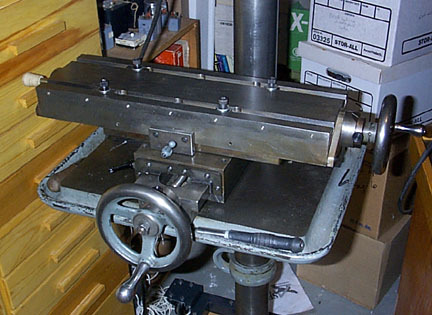 On this page I have put several jpegs of the milling machine which I inherited upon his death in 1997. He made it himself, though I am not sure of the origin of the plans. As you can see from the photos, it is constructed using the base, column and adjustable table from a heavy duty drill press. The parts made by my dad are the mill head assembly and the worktable. My apologies for the distracting mess in some of the photos. I had yet to set up my basement to properly position the machine in a place where there is enough room to work when I took the photos. I'm just grateful to have gotten it back together in working order after storing it disassembled for three years after my dad's death. It wasn't obvious until I got it all together that I would get it right! The next two images show the head assembly of the milling machine. As you can see it has four speeds which are selected by moving the belts to the right pulleys for the speed in question. The head takes collets sufficiently large to hold 1/2 inch cutters and smaller. The main casting for the head was made using a pattern of my dad's own construction. These two photos show the pattern for the head of the mill. My father seems to have made it out of pine, though with the paint I cannot be entirely sure. As you can see the pattern is color coded in the usual way, and it splits into two pieces to allow placing the core properly in the resulting mold. I'm not completely sure where he had this cast. It might have been at the foundry at his work or it might have been done by a friend. This is the sliding table that holds the work in the milling machine. My father constructed this himself. 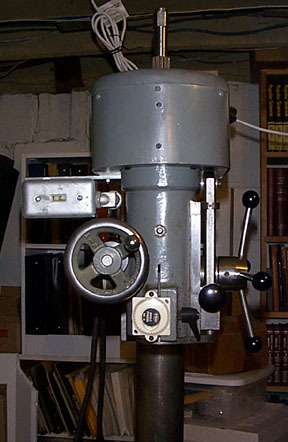 It bolts to holes threaded into what was formerly the table for the drillpress from which he constructed the machine. The table can be moved by the cranks you see on the front and right end.